Discover 6 tips for stress management & prevention. Don’t let stress get the best of you: Discover 6 tips for stress management & prevention. Stress seems to go hand in hand with the modern lifestyle. Life is filled with so many frustrations, deadlines, and demands. For many people, stress has become so normal that it is now a way of life. Stress isn’t necessarily bad, though. Stress can help you perform under pressure, motivate you, and even keep you safe when there are impending dangers. But when stress becomes overwhelming, it may damage your health, mood, relationships, and quality of life. Stress is your body’s way of responding to any kind of demand and/or threat. When you feel threatened your nervous system responds by releasing a flood of stress hormones, which include adrenaline and cortisol, which awaken the body for emergency action. Your heart pounds faster, your muscles tighten, your blood pressure rises, your breath quickens, and your senses are sharpened. The physical changes increase your strength, stamina, speeds up your reaction time, and enhances your focus. By applying the following 6 tips, you will be able to manage your stress more easily and prevent damage to your mind and body. Sleep is often taken for granted and seen as a sign of weakness among busy “hard working” individuals. But sleep has important effects on health and well-being. Lack of sleep influences stress. Sleep deprived individuals experience higher levels of stress and psychological strain than individuals who get a proper night’s rest. Sleep is one of the most important parts of health and performance. Get a better night’s sleep and improve your quality of life today! Hobbies are not reserved for people who lead quiet and relaxed lives. Busy people, with full lives may need hobbies more than the average person. It allows you to take a break, without real responsibilities, and brings meaning and fun to your life. Those who feel overwhelmed at a job can benefit from hobbies because they provide an outlet for stress and something to look forward to after a hard day/week at a stress filled job. Your workload is probably high, and you have many other (urgent) tasks on your to-do list. Because of this, you’re anxious, you can’t concentrate, and everything seems to distract you. End every night with a plan for the next day, including a morning routine. By creating a good morning routine for yourself, you can focus on the important things throughout your day. Plan your days according to Eisenhower’s Urgent/Important Principle as seen in the chart below. 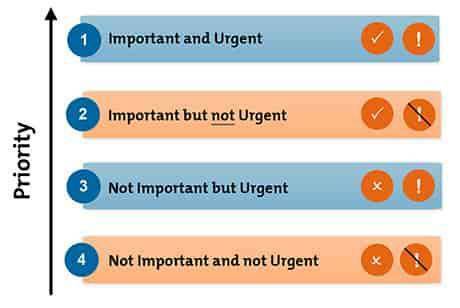 This principle helps you think about your priorities, and determine which of your activities are important and which are, essentially, distractions. Start your days goal oriented, efficient, and conscious while maintaining control over the rest of the day. Social engagement is the fastest, and most efficient way to manage stress and avoid overreacting to events that you perceive as threatening. Communicating with a person who makes you feel safe and understood calms your nervous system. Have lunch or coffee with a friend, accompany someone to the movies, schedule a weekly dinner date, or simply go for a walk with a workout buddy. Opening up to someone is not a sign of weakness, and most friends will even be flattered that you trust them enough to confide in them. Running errands, cooking, cleaning, doing laundry, and buying groceries takes up a lot of time. They seem like easy, simple tasks but they actually give you unnecessary stress. They do not add much value to your personal growth but do add weight to your shoulders. On-demand services are growing rapidly and looking at our current lifestyle it’s not hard to understand why. We want more convenience, more simplicity, and to be completely honest, we just need a hand sometimes. Have your groceries delivered, order some take-out (many healthy options available! ), and have your laundry, dry cleaning, and more picked up and delivered in just a few clicks. This leaves you with more time to focus on the important (see #3) and have some peace of mind. Exercise is good for your body. You know that. Everyone knows that, but you’re too busy and stressed to fit it into your daily routine. Even a little exercise however, goes a long way in managing stress. It pumps up your endorphins (your brain’s feel-good neurotransmitters). It’s meditation in motion, making you forget the day’s irritations while only focusing only on your body’s movements. It also improves your mood, your self-confidence, and relaxes you. Spending even a few minutes in meditation a day can restore your calm and inner peace. Anyone can practice meditation, as it’s simple, inexpensive, and doesn’t require special equipment. Check out Headspace for guided meditations that you can easily fit into your day.